the Transparency Report, we said we hoped it would shine some light on the scale and scope of government requests for censorship and data around the globe. Today, for the seventh time, we’re releasing new numbers showing requests from governments to remove content from our services. 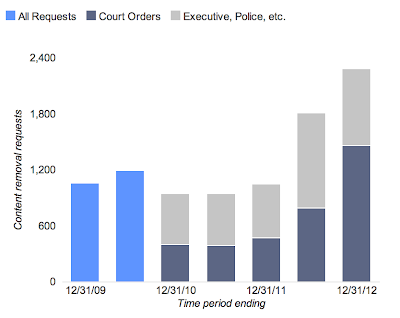 From July to December 2012, we received 2,285 government requests to remove 24,179 pieces of content—an increase from the 1,811 requests to remove 18,070 pieces of content that we received during the first half of 2012.